"Some people seem to believe that for each problem there is a solution readily available - a solution that can be promptly achieved by passing a law and voting some money. I think of this as the vending machine concept of social change. Put a coin in the machine and out comes a piece of candy. If there is a social problem, pass a law and out comes a solution." "John William Gardner"
The Canadian Social Enterprise Guide is the first extensive and comprehensive published resource, tool kit, and collection of social enterprise stories. The guide reflects the learnings and resources of the eight years of development and implementation of the Enterprising Non-Profits program. It includes chapters written by enp staff, social enterprise practitioners, professional trainers, funders and organizational development expertise. Social Capital Partners: Invests in and incubates revenue-generating social enterprises that employ at-risk youth and other populations outside the economic mainstream in Canada. SEDI: SEDI stands for Social and Enterprise Development Innovations. Are a non-profit organization that assists people who are struggling economically. SEDI motivates them to aim higher and develop the tools they need to achieve their goals, in partnership with community groups across Canada. Social enterprises are non-profit, co-operative and for-profit businesses that provide goods and services to earn revenue and achieve social, economic, and/or environmental goals. Successful social enterprises play an important role in our local economy and make vital contributions to our communities and the environment. This section focuses on non-profit and co-operative social enterprises. There are also for-profit businesses that are making a significant social and environmental impact. To read about some of these companies, start here. Content Sourced: VanCity British Columbia, Canada, Definition. Blending Business With Charity Can Be 'Head-Busting' Work by Wallace, N.
Bridging the culture of business and poverty by Bradley, James. Business Planning for Social Enterprise by Alter, Kim. Business Practices in Social Enterprise by Bull, M., Crompton, H.
Charities Doing Commercial Ventures: Societal and Organizational Implications by Zimmerman, B., Dart, R.
Community Power. Lessons for nonprofit entrepreneurship by Hoffman, D.
Does Misery Love Companies? How social performance pays off by Margolis, J. Employment for Former Prisoners by Shuetz, P.
Engaging Small Business in Corporate Social Responsibility: A Canadian Small Business Perspective on CSR. Exploring the Climate for Earned Income Development by Horsnell, A. Five Social Enterprise Myths, Dispelled by Burn Ace, K.
How Organizations Create Social Value by Salls, M.
How your nonprofit can enhance capacity, impact and sustainability by Horsnell, A., Pepin J.
Identifying Your Best Earned-Income Opportunities by Horsnell, A. If the shoe fits. Nonprofit or For-Profit? The choice matters by Gair, C.
Managing the Double Bottom Line: A business Planning Guide for Social Enterprises by Alter, Kim. Marketing a Social Mission by Utterback, M.
Marketing for Community-Based Social Enterprise by Lamb, P.
Migrating from Innovation to Entrepreneurship by Boshee, J. Practical People, Noble Causes. by Thake, S., Zadek, S.
Practitioner Understanding of Social Return on Investment by Thys, D., Tulchin, D., Ohri, C.
Prophets for Non-Profits? The prospects for venture philanthropy in the developing world. PuraVida: A Business with a higher calling by Tishler, C.
San Patrignano. A Model of Integration by Wolley-Fisher P.
Social Purpose Businesses: Making the Transition From Raising Money to Earning Money. Social Venture Partners Calgary by Orloff, A. Sustainable Development in the digital age by Peizer, J. Taking Stock of Your Business Development Assets by Horsnell, A. The Growth of the Social Enterprise by Tishler, C.
The Income Diversification by Tranquada, W.
The meaning of "Social Enterpreneruship" by Dees, G.
The Nature of Returns: A Social Capital Markets Inquiry by Emerson, J. The Strategic Marketing Matrix for Social Enterpreneurs by Boschee, J.
Thibodeau's Centre. A successful Model of Social Entrepreneurship by Sayani, K.
Turning Administrative Expenses into Opportunities by Tranquada, W.
Unleashing New Resources and Entreprenurship … by Reis, T.
Using big business to fight poverty by Lodge, G.
Using Big Business to Fight Poverty by Lodge, George C.
Ways to Market Social Responsibility by Lagace, M.
What Works by Szalavitz, M.
Why running a nonprofit is the hardest job in business by Tishler, C.
Abbotsford Recycling Industries Social Enterprise (ARISE) is a social enterprise hybrid concept that posits the melting and casting of recycled glass into long-lasting products such as glass bathtubs, sinks, and wall blocks, all with artistic elements. ARISE will be owned by both traditional business and non-profits, and will employ the marginalized wherever possible. The Continued Reintegration Inmate Support Society (CRISS) was formed in order to propel a social enterprise that will be a training business for ex-offenders and inmates transitioning to the community. The business will be a retail shop that sells consigned inmate art, with living units on the premise. 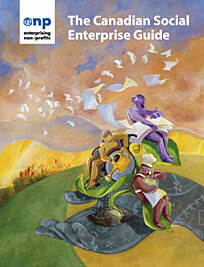 Over the summer of 2005, the Centre designed an interview tool meant to map local social enterprises. The results and the tool template are available. Communities wishing to adopt this template to map their own communities are requested to recognize the Centre as template originator, and invited to share their own community results with us! In June 2005, the Centre hosted a Social Economy Forum in Abbotsford, one of nine in the province. The final report can be viewed here. Community animator, Centre supporter, and ARISE originator Sid Gould leads the way in championing the need for a separate social enterprise business structure in Canada. His discussion paper on the topic can be viewed here.